So in the middle of dineLA’s Restaurant Week, we decided to pay a visit to Upstairs 2 for some dinner. This little restaurant hangs out above the Wine House in West LA and if you didn’t know what you were looking for, you would probably never find it. Luckily, we knew what we were looking for and found it just fine. After parking on the roof, I found the restaurant to have a pretty swanky atmosphere that was just light enough to read the menus. As we all began to read our menus, we realized that although the Restaurant Week fixed menu looked good, it did not look nearly as good as the items on their regular menu, so one by one, we all decided to forget restaurant week and go our own way. This regular menu was uniquely organized by the type of wines the food would go with and consisted of smallish plates that were bigger than tapas, but not quite the size of a full entree. We way began with an order of their Medjool Dates Wrapped in Serrano Ham for everyone to split. 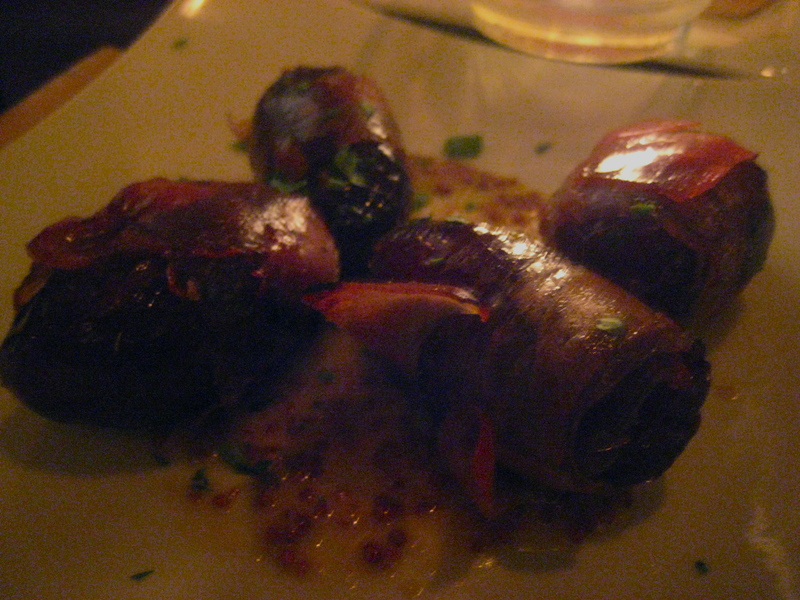 These were stuffed with Asiago cheese I found them to be a nice twist on bacon wrapped dates. After that, we went our separate ways with our orders. I decided on two things. The first was their Prosciutto and Fig Flatbread. I wasn’t really sure what to expect from this dish, but when it came out, it looked pretty amazing. I bit in and almost squealed with delight. 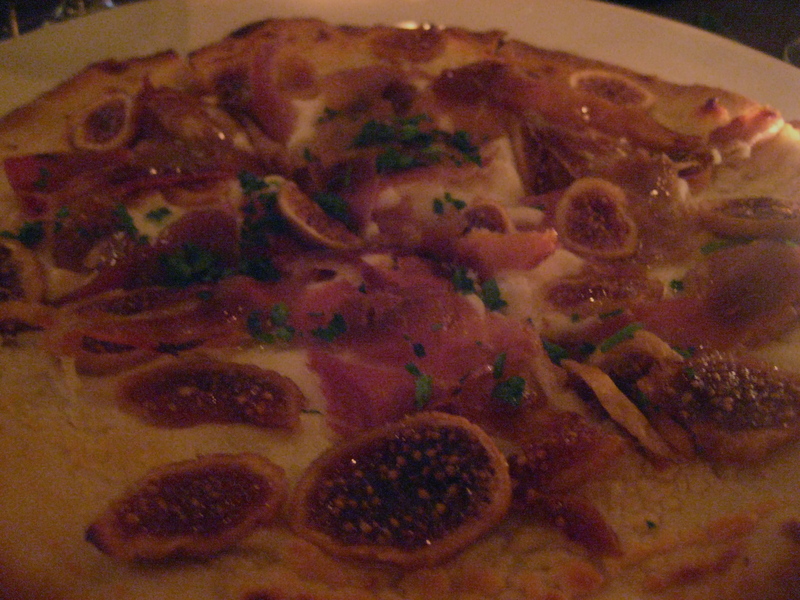 This was one of the best individual foods I had ever tasted, I don’t know what they did, but somehow they made the cheese, bread, figs and prosciutto work together in such delicious harmony that makes me want to go back there right now as I write this and eat it again. To follow up this amazing flatbread, I ordered their Grilled Elk Tenderloin. This came with sauteed spinach, roasted fennel and sherry glaze. I asked for it without the spinach, which must have been mixed with the fennel, because the waiter gave me a quixotic look as he told me it would come out simply as the elk and I told him that was perfect. The elk came out just as I had hoped it would, free of any frightful veggies. It did look a bit naked, but I was fine with that. 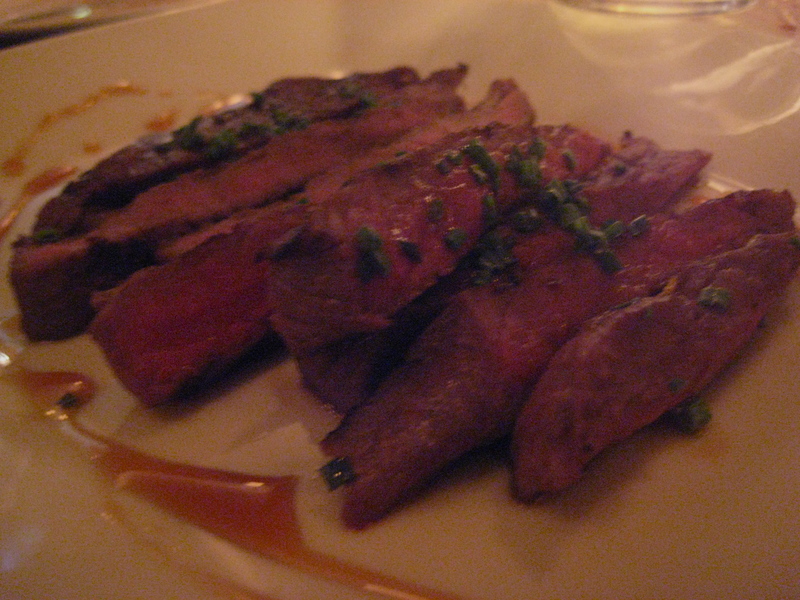 It tasted pretty similar to beef tenderloin, but had a stronger overall taste to it while being a bit tougher. I’m really glad Restaurant Week led me to Upstairs 2 so I could eat that amazing flatbread. Although nobody took advantage of the fixed meal, the food I ended up eating was really very good.